Highlights: With this Hop On - Hop Off City Tour in our blue double-decker cabrio busses you have the possibilty to create your own individual Sightseeing Tour in Frankfurt. 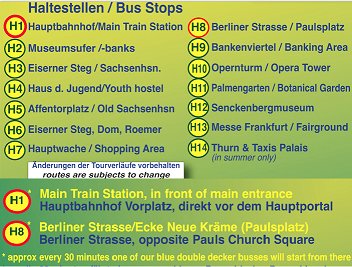 On our Hop On - Hop Off City Tour in the blue double-decker busses you have the possibility to create your own individual Sightseeing Tour in Frankfurt with the choice of 12 different languages (earphone service). From the upper deck you will have great views on all the highlights of the city. Simply hop off at one of our 14 bus stops, visit the sights close by and then continue the tour with one of our next busses. Explore the former Coronation City of the German Emperors and the modern European Banking Center. We show you the diversity of our historic and modern metropolis. Come and see one of the largest European rail stations, the Museum Embankment, European Central Bank and the banking quarter with its skyscrapers - among them the biggest office buildings in Europe. Hop off and walk across the historic heart of the city called "Romer" - marvel at our famous old city hall, visit the Paul's Church and the Cathedral. See the "Hauptwache" - former headquarters of the city's Stadtwehr militia, our shopping street "Zeil", the beautiful Old Opera, the big towers of the former city wall and our international fairgrounds. Bus stops: You find this sign at all our Bus Stops to join the tour.